With Southern England windy, waterlogged and drenched again, the crossing to Heysham was surprisingly calm, in sunny weather and on time. Long arduous drive though to Andover to see cousin Jose following her husband, Dennis’ death last Thursday. Linda and Mick also there, remarkably, the first time Sal had seen Mick since their wedding in the late 70s! We also now have a booking for the 2015 TT in May/June! Holiday Inn in Reading West is adequate, not flooded, but the bathroom has definitely seen better days. Meal in hotel again adequate but we were late and the only ones there. Good night’s sleep. Absolute deluge again and as we drive to Flic’s it is clear that so many fields are flooded. Signs seen to avoid Windsor as well as Datchet and judging by the news reports, both are under water. Flic well but still sore. Epidural on 26th as well as courtizal injections which hopefully will relieve the pain of the last 7 years. By now sunny and arrive at Heathrow just before 3 for an 8:35 flight so plenty of time. Parking easy to find and a good few hours in Executive Lounge although we seemed to be infectious judging by a group from the Far East wearing face masks in the lounge. Not overly impressed with BA’s continued insistence with back to front seating in Club Class. Stranger next to me seems to have trouble in getting his son (aged about 8) to sleep. Not much sleep myself. Long walk to Terminal 3 in Dubai and have difficulty again in finding right place to go for lounge for Qantas flight to Sydney. 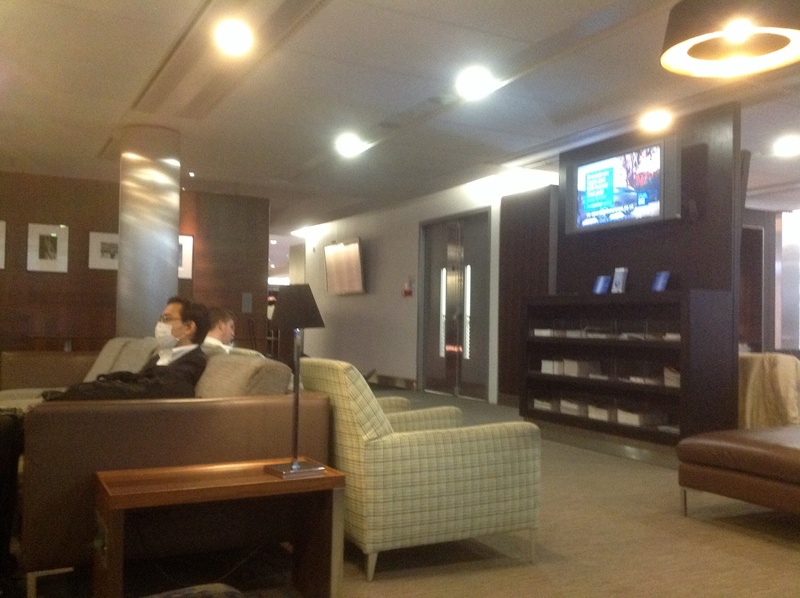 It is in the Emirates lounge! More comfortable seating in Qantas with better configuration. Long flight to Sydney, so good night or is it good morning? An upstairs seat in a much better configured A380 Qantas plane. Qantas seem to have the formulae right as far as seating configuration is concerned. 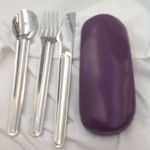 I would however question their taste in cutlery. 13+ hours on one flight is a long time and whilst I am not a great film lover I did manage to see The Railway Man (Colin Firth & Nicole Kidman, who was made up to like like Jenny Agutter from her Railway Children film, starred). An excellently moving film. Arrival at Sydney was on time and we were in the car to take us to our hotel 30 minutes Later. However, the Travelodge hotel in Wynyard is a great disappointment, the room smelling musty, the sheets seemingly damp bordering on wet and up a hill from the harbour area. Not what we thought we were getting and not a credit to Audley travel. We were told initially the room was not ready which just proves the staff had no idea as we had paid for the previous night. Nevertheless, we manage a couple of hours rest before heading downhill to the harbour area and a walk to the Opera House. Find lift to reception area and enquire about a tour then head back for lunch in one of the many eateries along the waterfront – expensive. Neither of us feel up to doing much so get one of the red open top bus tours around Sydney for an amazing price of A$30 each. However, there isn’t a great deal to see and what there is to see is often commented on either well before we reach it or, more annoyingly, well afterwards. Long waits at stops as driver has to collect fares from new travellers, there being no other staff on board. Still, we learn good snippets of information and locate the National Maritime Museum although not Nimo! Sal doesn’t do hills upwards which is one of the reasons for our disappointment at the hotel, so get taxi back to hotel although not sure taxi driver was impressed at such a short journey. Only 30 minutes of free Internet access allowed at the hotel and use up our daily half hour before falling asleep until half eight. Not inclined to go out for a meal so just a Starbucks coffee and a muffin tonight; healthy, I think not! Manage to contact John & Sue Bowring (ex G & S, IoM) and arrange to meet with them on Sunday afternoon. Good sleep tonight. Cooler today after last night’s thunderstorm, overcast but dry. After a Starbuck’s breakfast head to Red Bus tour for the Bondi beach circuit. First, the City tour to the Bondi beach tour stop and the timing of the commentary is even worse than yesterday, completely missing out one item and covering something about the town hall at least one stop beforehand. I never did see the lion with the closed eye! The Bondi tour however was good although we didn’t get out at Bondi – not enough time on our ticket. 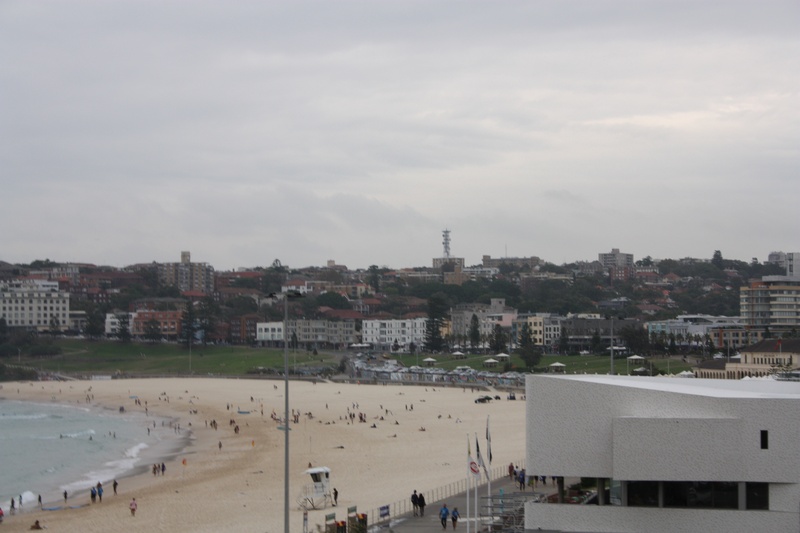 The drive back along north Bondi and Rose Bay showed us another side to Sydney; affluence in their houses and area. Stop off at Station where there is a small railway themed bookstore. No purchases but do spot a DVD of a driver’s eye view of a train journey from Waterloo to Reading, how random is that. Lunch in a small cafe, much cheaper than the waterfront and a walk back through QVB which Pierre Cardin had once described as “the most beautiful shopping centre in the world” – an apt description. Superbly renovated with a couple of wonderful clocks, stained glass windows and ornate floor tiling, the original building dates from 1898 and was to be demolished in the 1960s after it ceased to be a market. Today’s Internet half hour allows us to even complete a few Lexulous games! Woolworth’s here is a food store, so provisions for breakfast bought. Dinner in adjacent Japanese Restaurant as there is nothing else within immediate vicinity that doesn’t involve hills. It is an OK meal, nothing spectacular. A grey and wet day to start with and I had left our rain ware at home! Nevertheless, after the ubiquitous Starbucks, we head off to Circular Quay, by which time most of the rain has passed, and just manage to catch the 11:00 Manly ferry which is quite crowded. The vessel has two “front ends” so does not need to turn around, thus saving time on the journey. 30 minutes crossing in the greater Sydney bay and we leave along with probably 900 or so other souls for an explore of this area. A surfing competition is being held on the other side of the town but the weather has obviously put a dampener on proceedings and the viewing stands are virtually empty. Walk along the coastal path for a short distance towards Shelly Beach away from but still in sight of the surfers. 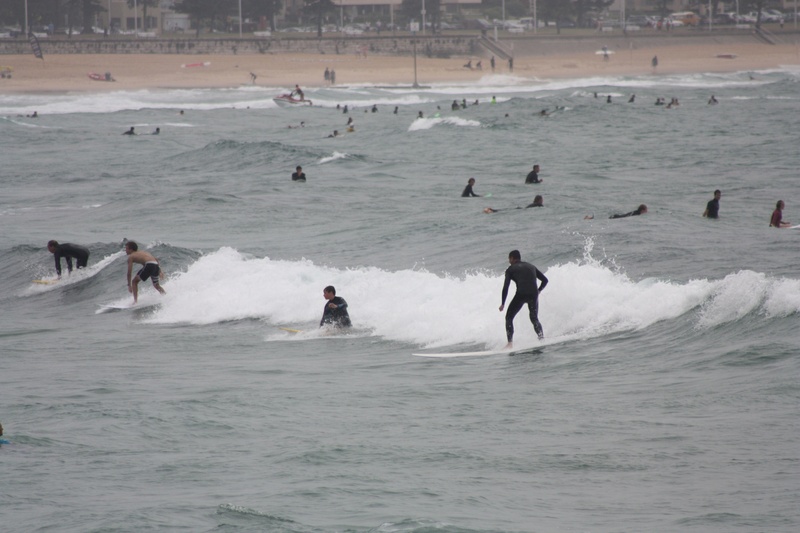 Manly has an area of water called the “World surfing Reserve” which is not surprisingly where the competition is being held. Back into town for a leisurely lunch at a local fish restaurant (Fiasco), followed by an ice cream and return to Circular Quay on the ferry. 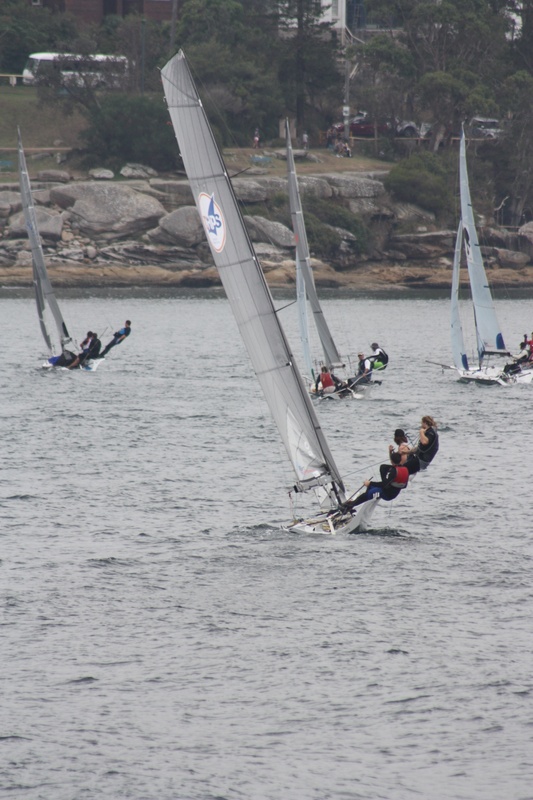 Sit outside on – deck and watch many sailing boats probably in several races. 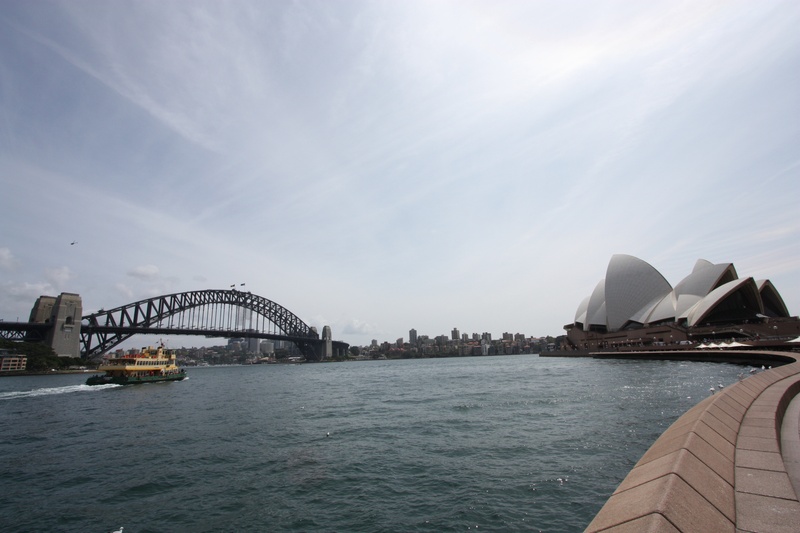 Get details of what’s on at the Opera House and then take a leisurely walk back to hotel. Britain won a gold in the Winter Olympics!! A dry start but that soon turns to quite heavy rain so the jet boat is not really an option. 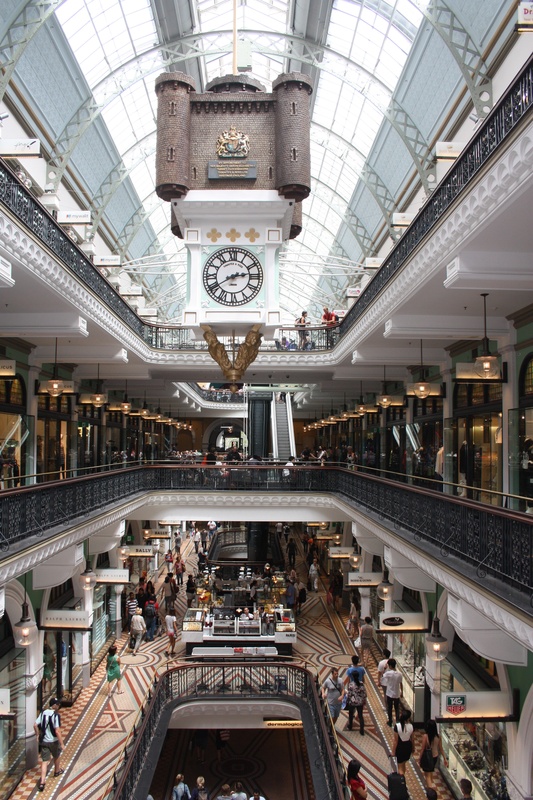 Instead, leisurely walk to QVB for coffee, watch the clock strike 12 and then off to the Westfield shopping Centre for a stroll out of the rain. Lunch is a couple of pies as take aways that we eat in our room after succumbing to buying an umbrella. 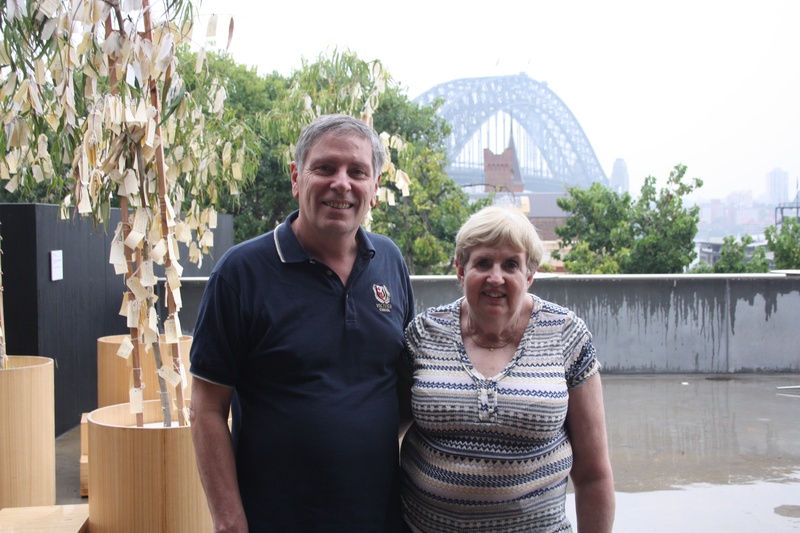 John and Sue Bowring meet us in the foyer and we all walk down to the Contemporary Arts Centre on the Waterfront for a coffee before walking the rest of the waterfront towards and under the Bridge past what Sue describes as the most expensive hotel. The fairground opposite the harbour is apparently an all year round attraction that somehow looks a little out of place so near the Bridge. Nearby are some of the most expensive apartments in Sydney that sell on for in excess of A$50m each and although the view is not as good today as it might have been had the weather been better, you can see why they would be so expensive. 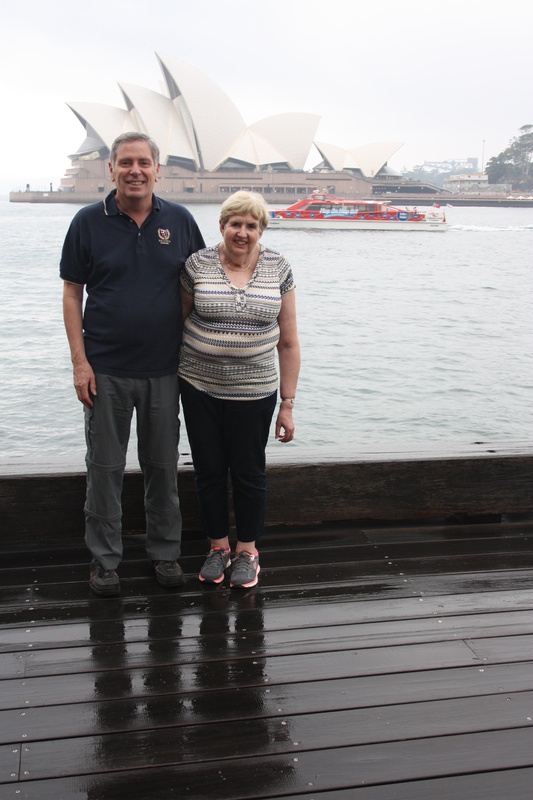 John is persuaded to take our picture with the Opera House in the background in between their commentary on the area – John and Sue certainly seem to have settled here, Sue even having sung in the Opera House. Slow walk back to hotel and then off for dinner at Vapiano which I understand is a Swedish concept as you pay for your meals on a “debit card” but an in-house one, paying with real money when you leave. Basically, it is a tab as we would know it but with your own card. Still raining although forecast is better. 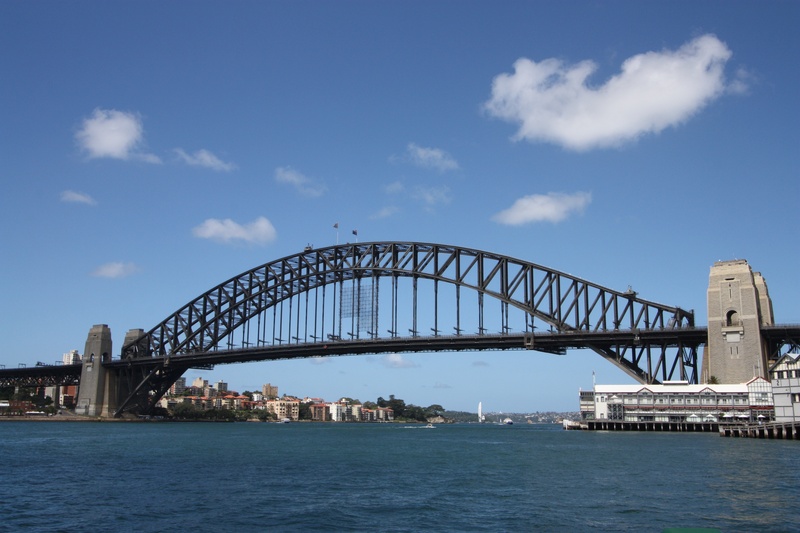 Sue had suggested visiting Parramatter by ferry. 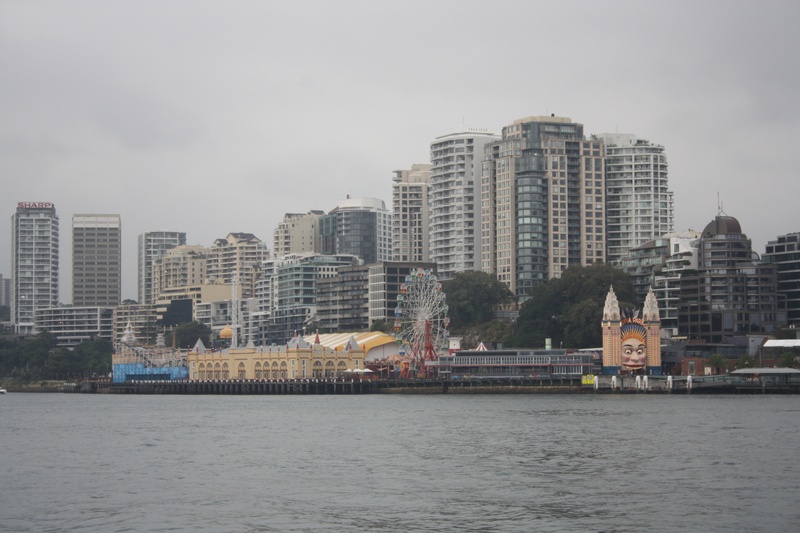 By the time we were at the harbour, the rain had stopped and we took a seat at the front of the vessel, wind in our faces as the ferry, good value at $14.80 each return, stopping at various places along the way in a 90 minute journey to the end of the navigable part of the river. 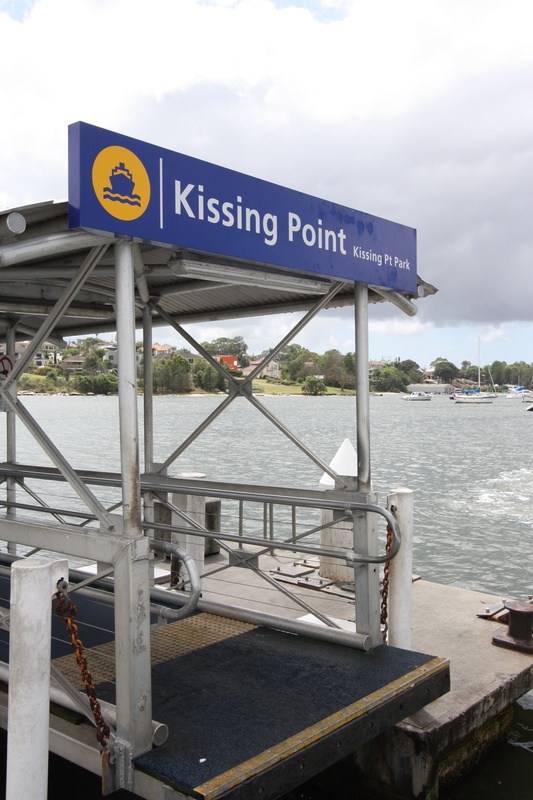 Kissing Point wharf, an interesting commuter stop! As one would expect, many fabulous (and probably fabulously priced) waterfront houses and private craft passed and a few interestingly named wharf stops; Kissing Point and Cockatoo island to name but two. 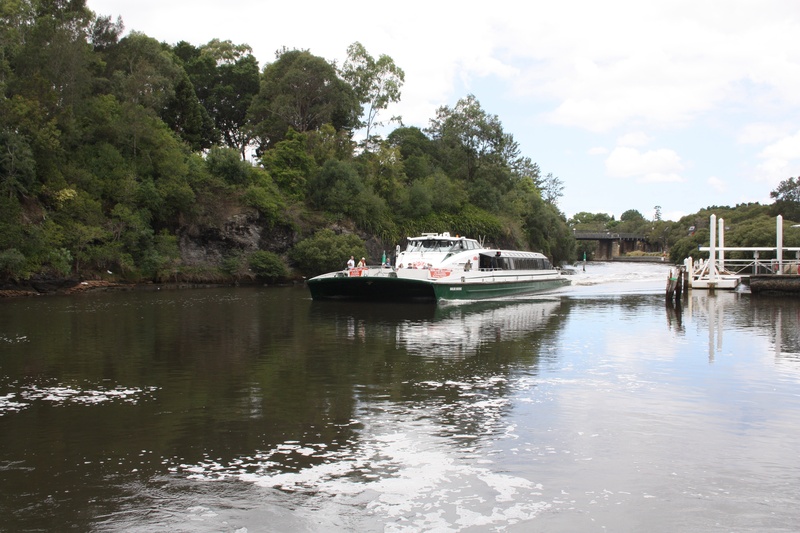 The vessel, seemingly all named after famous Australians such as Eelong Goolagong, slowed down nearer Parramatter as by now residential had turned into industrial and vegetation at the side of the river. Disappointed to find rubbish on river was quite high and there was evidence of oil spillage. Parramatter reached and a walk further up stream to town which apart from some high rise modern buildings seems to be similar to some towns we visited in NZ last year with canopy walkways and single storey shops all of which have definitely seen better days. Back to quay and catch next ferry back taking in the view from the outside front again. Passing first the vegetation by the side of the river causing us to stay slow but passing into the industrial sites and waterfront housing which allowed us to travel much quicker. By now the sun is out so views better by the time we reach Sydney harbour. Coffee in waterfront area and tickets booked for Magic Flute on our return to Sydney in about 5 weeks time. Yesterday, John had invited me to take up a free ticket he had been given and Sue couldn’t use to see a conversation between Richard Roxburgh and Jessica Hobbs organised by the “equity foundation”. Now I knew nothing of these two before this but RR is in Rake, an Australian sort of spoof crime series directed by JH. Lots of young actors and actresses in the audience and some interesting dialogue between the two mostly centered around the relationship between actors and directors. A few questions at the end including one from an extra who had a bread roll thrown at him in one of the episodes of the 1st series. Back to hotel at about 7:40 to pick up Sal and walk up road to Vapiano again for evening meal. Before the talk, John took me to see the old part of the library with a fascinating map shown as floor tiles as you enter about the voyages in the 1640’s that charted a lot of the coastline of Australia. The voyages were undertaken by two Dutch ships under the captainship of Abel Janszoon Tasman. A wonderful sight and it is a pity we have so little time to explore more of this and the library itself which has characteristics similar to the one we viewed in Boston last October. Off to Tasmania after breakfast in Starbucks. Hotel absolutely mobbed pre check out with a group in and a group out. Hotel happy to offer a refund of phone call and transport to airport in view of complaint about standard of room on arrival but transport never materialises so hotel persuade a taxi to get us to airport free of charge (to us).